Bournemouth striker Callum Wilson has overcome some “incredible setbacks” on his way to becoming Gareth Southgate’s latest recruit. The 26-year-old has been rewarded with his first call-up to the senior England squad after an excellent start to the Premier League season – but international football is a far cry from Wilson’s challenging childhood. “I was in foster care for a bit when I was younger,” said Wilson in an interview with Football Focus in October. The situation at home and “erratic” form as a teenager nearly saw him leave the game on two occasions. 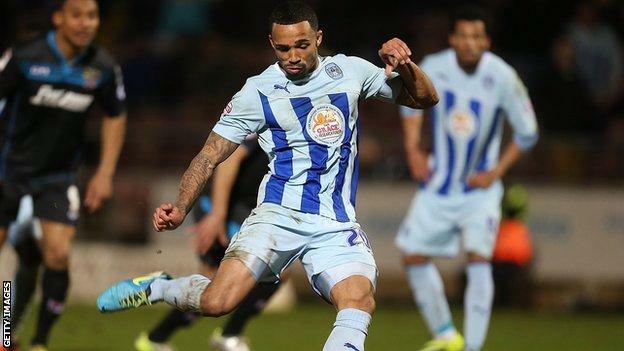 BBC Sport looks at the striker’s journey from playing in local cages to England international. Wilson’s first taste of a professional set-up came as a schoolboy on the books of hometown club Coventry City. The young striker’s pace and power were evident from a young age, but his domestic setting was already threatening to derail a career that had not yet begun. “Callum was in and out of the academy,” said Coventry City academy manager Rich Stevens. Although he had been released from the Sky Blues’ youth system, Wilson’s development continued on the streets, away from the sheltered environment and immaculate facilities at the Alan Higgs Centre. “He went out of the programme and played with his mates, who are older than him, in the local cages and on the streets,” added Stevens. “Callum was reintroduced to the academy at 15, which is when I first met him. He was driven, hungry and very athletic. Wilson progressed through the youth ranks at City, before spending time on loan in the non-league. However, injury concerns and inconsistent performances meant the striker was set to be released for a second time at Coventry. Former Sky Blues manager Steven Pressley said: “When I first arrived at Coventry, Callum’s contract was due to expire at the end of that season and he was training with the development squad rather than the first team. “He wasn’t a player the club were looking at in terms of the future. “After my first session in charge of the senior side, I went to watch the development squad train and Callum was one of two players who stood out. Despite an “erratic” pre-season, Pressley took a leap of faith in the youngster and opted to start the academy product alongside Leon Clarke. Wilson, buoyed by the manger’s confidence in his ability, never looked back. “We got him fitter and sharper than he had ever been,” added Pressley. “He had incredible pace and power which was always going to disturb opposition defenders at any level. “It wasn’t a smooth pathway for Callum and he had some incredible setbacks including several serious injuries, but he is very determined and he is a brilliant lad that I cannot speak of highly enough. Can he make an impression for England? England enjoyed their best finish a World Cup in 28 years during the summer, as captain Harry Kane won the Golden Boot for finishing the tournament with six goals. The Spurs striker is expected to lead the line for Southgate’s side for the foreseeable future, but Wilson’s pace and direct running could provide an alternative option, or even support alongside Kane should the formation allow. Wilson, who joined Bournemouth in 2014, suffered anterior cruciate ligament injuries in both knees during a 16-month spell with the Cherries, but he appears to be growing in confidence each week. He has scored six goals in the league so far this season, as many as Kane, and he has been involved in more goals than any other Englishman in the top flight, adding four assists to his goal tally. “Callum is developing all the time under a very good coach in Eddie Howe, and the system at Bournemouth suits him,” said Pressley. “A Kane/Wilson partnership would go against what England are trying to do, but I think they could be suited to play together.